In the past few years, we’ve seen many light bulb phase-outs aimed at removing inefficient incandescent and fluorescent bulbs. We’ve also seen companies rolling out newer, more efficient bulbs and lamps such as LED T8s. Overall, the lighting industry and civilization itself are progressing toward lighting being as energy efficient as possible. A true increase in efficiency, means decreasing energy losses without sacrificing current levels of lighting brilliance and utility. After all, if it’s just about using less energy, we could dim all of our lights for the same effect. Progress means that lumens, color, and usability increase or stay at their current level as energy and production costs decrease. So how do T8 light bulbs stack up with the current forward motion? Are LED T8s really any better than using your current fluorescent lamps? Fluorescent tubes have had a very long history with many advances made in their design, production, and efficiency. At this point, they’re only slightly behind LED lights on efficiency and lifespan, but, barring some major technological breakthrough, there’s little we can do to truly improve fluorescents without developing a new technology altogether. Fluorescent tubes now have much higher lumen and CRI values than previous lamps. They also last longer, use less energy, and have improved on-times thanks to better electrical ballasts. And even with all of these improvements, fluorescent T8s are still inexpensive on a per-bulb basis (the ballasts themselves can be fairly expensive). However, some of a fluorescent’s strengths come with disadvantages. The newer ballasts last longer and help to improve lamp life, but while the bulbs are inexpensive, a good ballast is costly. That same ballast introduces an additional failure point, since it will eventually wear out. No matter how efficient a fluorescent is, flickering and warm-up time are still hallmarks of a fluorescent bulb. Both problems are compounded by cold temperatures. And, while they contain less mercury than a can of tuna fish, fluorescent lamps do contain mercury and require careful disposal. Meanwhile, LED T8s have fewer failure points because they are self-driven and can be connected directly to a building’s line voltage. It should be said that direct-wire LED T8s should always be installed by a licensed electrician. Even so, they’re easy to install, with newer bulbs being designed to work with existing T8 ballasts for end-user installation without a licensed electrician. Unfortunately, each individual bulb is far more expensive than a fluorescent tube. So, if fluorescents are already efficient and long-lasting, what benefit would an LED T8 give? For one, LED T8s aren’t as fragile. Most LED T8s are made from plastic rather than glass, without any tiny filaments or internal phosphor paints to break or erode. You’ll also find that, with rare exceptions (typically caused by incompatible dimmers), LEDs do not flicker when turned on or while in use. Once the light is active, it’s active at full brightness, without a warm-up period. LEDs work under a greater range of temperatures compared to fluorescents, and they aren’t negatively affected by cold. Standard LED tube lights are also safe for UV-sensitive areas because, like most LED light bulbs, they don’t emit an appreciable amount of UV. It’s true that the difference in efficiency and longevity between high-efficiency fluorescents and LED T8s is marginal, but there is a difference. 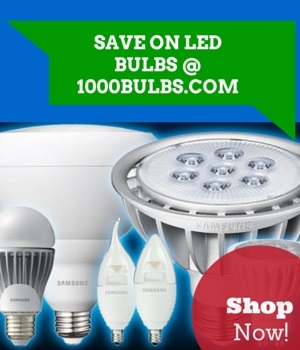 While LEDs are more efficient and longer lasting, they can be expensive. Overall, it’s best to use fluorescent lights when you need to install many lights in a temperate area, and LED T8s when you need fewer lights, are lighting a colder environment (where fluorescent lights can be problematic) or for color intensive rooms. You may also want to use LED T8s if you’re one of the few people sensitive to the high frequency flickering of a fluorescent light. So, have you used the new LED T8s before? We’d love to hear what you think about them. Do they work better for you than traditional fluorescents? Tell us about what you've found, or ask us any extra questions we didn't cover in the article by leaving a comment below. We’re also open for questions through Facebook, Twitter, Google Plus, LinkedIn, Pinterest, or Instagram! Mar 22 What are Ultraviolet Germicidal Lamps?